A three-degree alumnus who enjoyed a 33-year career as an associate professor has never forgotten the impact that Southern Illinois University had on his life. Steven Spaner earned a bachelor of arts degree in psychology in 1966 and master of science in education and doctor of philosophy degrees in educational psychology in 1969 and 1970, respectively, all from SIU. He subsequently commenced a tenure spanning more than three decades as a faculty member at the University of Missouri – St. Louis, where his teaching focused on statistical methods, research design, and measurement and evaluation. His research foci were varied as he teamed up with many colleagues and professionals throughout his career. Spaner’s work ranged from a longitudinal study of birth traumas on early childhood development, started while he was a doctoral student; to international comparisons of test anxiety in elementary school age children, longitudinal effects of pregnancy resolution choices among Danish women, and client understanding of chronic venous disease. Spaner is grateful for his SIU experience and wanted to give something back. “My three SIU degrees made me what I am today,” he says. So Spaner has established a $10,000 charitable gift annuity through the SIU Foundation. A charitable gift annuity allows individuals to enter a contract with the Foundation. Through this agreement, the individual contributes cash or property to the Foundation, and in return, receives partial tax deduction and an annual income. The SIU graduate chose to support the university through his IRA. “People are living longer these days and upon reaching 70.5 years of age, you have to start withdrawing 4% out of your IRAs. So this option allows me to support SIU and receive an income,” he says. 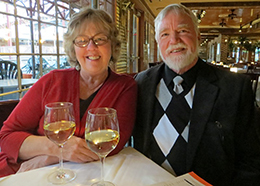 Spaner’s contribution will support a fund started by longtime friend and classmate Patricia (Borgsmiller) Elmore, an associate dean in SIU’s College of Education and Human Services. Both have committed their careers to higher education, and were members of the American Education Research Association. They stayed connected through the AERA’s special interest groups. Retired since 2002, his current location offers him similar surroundings to his days at SIU. Spaner and his wife, Judy, co-own Heaven on Earth Bed and Breakfast in Marthasville, MO. The couple, married since 2006, operate this relaxing getaway of two one-room cabins in the scenic Missouri Wine Country: www.heavenonearth.ws.